Hope you all had a good off-season and are ready to go for the first GGLC autocross event of the year. Registration is now open for the April 23rd (Saturday) event at Marina. As usual only participating GGLC members can register during the first week of registration. Club members are also given preference on the waitlist. Click here to sign up via MotorsportsReg The cost is $60 for members and $70 for non-members. * This first event of the season will be a points event for club members, not a practice event. * All morning runs (usually 5) will count towards the point series for GGLC club members. The Red Rock Hotel (LOG HQ) is now taking room reservations for Lotus Owners Gathering 31 to be held in Las Vegas from Oct 14-16. Call them at 702 797-7777. LOG rate is $130/night + tax (about $145 w/ tax). Tell them you’re with the Lotus group. You’ll be required to pay the 1st night. You can cancel up to 3 days in advance. We went through a bunch of different designs, with horizontal stripes, car cut-aways, big flash photos of cars, Union Jack flags and other elements. 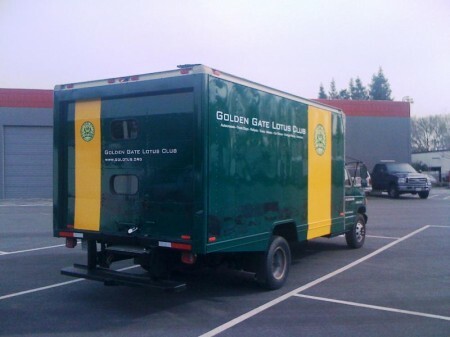 The final design is bold – big vertical yellow stripe; messages – GGLC logo and GGLC branding; statement – says what the GGLC is about; cars – shadowed/ghosted car images down the length of the truck. 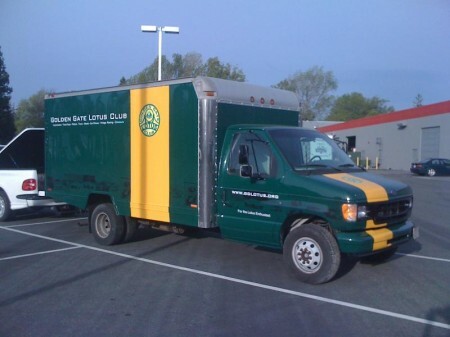 For more info on the GGLC truck visit its official webpage. Registration is now open for the Golden Gate Lotus Club’s second track day of the season at Thunderhill Raceway Park in Willows, California on Thursday, March 31, 2011. We will be running the long course configuration in the standard (counter-clockwise) direction. We will also be running our traditional format where we bridge the run groups in order to provide you with maximum track time. You will sign up for either Novice/Intermediate or Intermediate/Advanced. Note that we have introduced an early-bird pricing policy. Cost will be $150 for members and $170 for non-members, up until March 17, 2011. After this date, the price will go up to $170 for members and $190 for non-members. Please sign up early to ensure the lower price. Also, Thunderhill is reminding us that they will be strictly enforcing a 103dB sound limit. This should not be an issue for most cars but please be aware of the requirement none the less. Lotus Engineering, a company with over 20 years of EV and HEV experience, has been responsible for all aspects of the electric drivetrain integration for 102EX, the Rolls-Royce Phantom Experimental Electric. This includes the largest battery pack fitted to a road car, together with an innovative 7 kW induction charging system. These components and the electric drivetrain have been integrated by Lotus Engineering into the existing Phantom electrical systems, giving an efficient electrical propulsion control strategy and retaining full vehicle functionality. Lotus Engineering has a broad expertise in vehicle design, manufacture and development. For the Phantom Experimental Electric project Lotus Engineering provided engineering services in the areas of: drivetrain layout, vehicle simulation, Computer Aided Engineering (CAE), component specification, vehicle build, control strategy, control integration, procurement, commissioning and development testing. This project highlights the technical competence in Electrical and Electronic Integration and the capability and range of consultancy services offered by Lotus Engineering. The Phantom Experimental Electric has two electric motors to replace the 6.75 litre V12 engine. These electric motors each produce 145 kW of power to provide a total 290 kW and torque of 800 Nm giving a 0 – 100 km/h time of under eight seconds and a top speed limited to 160 km/h. In the conversion of a Phantom into an electric vehicle a study was conducted to ensure that the optimum layout of the electric drivetrain and ancillaries was achieved with no intrusion into passenger compartment. Following an iterative design study the 71 kWh, 640 kg lithium ion battery pack was placed under the bonnet where the engine had been. The two motors, gearbox and inverters were located behind the rear seats in the original fuel tank bay, with power cables running longitudinally between the converters and the battery. This has enabled the Phantom Experimental Electric to retain its 50:50 weight distribution and characteristic Rolls-Royce driving experience. The Rolls-Royce Phantom is a complex vehicle with many advanced electrical systems. The integration of the electric drivetrain and ancillaries with the existing vehicle control unit provided the greatest challenge for the project. To compound this the Phantom Experimental Electric features the additional complexity of a 3 mode charging system (single phase, three phase and the inductive power transfer) together with a two level driver selectable regenerative braking system. Dr Robert Hentschel, Director of Lotus Engineering, said “The Rolls-Royce Phantom Experimental Electric is an extremely advanced vehicle. I am delighted that Rolls-Royce Motor Cars has recognised Lotus Engineering’s world class engineering capability and chosen us to be a part of this project. 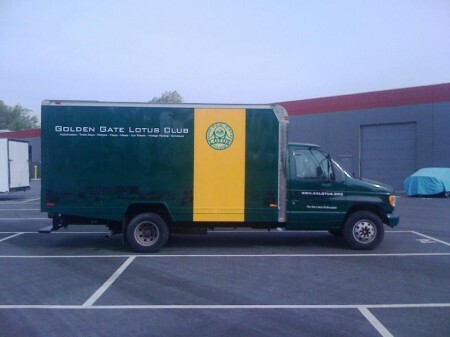 We have taken a great deal of pride working for such a prestigious ultra luxury brand and I believe that this project illustrates the technical competency of Lotus Engineering in Electrical and Electronic Integration and the capability to apply our expertise to a wide range of applications and types of vehicle”.